A hybrid cultivar of the Mexican Sage, Salvia leucantha ‘Pink Velour’ lives up to its name with soft pink flowers with a white calyx. This is a hardy, well behaved low growing salvia. It reaches around 80cm in height, and forms a small clump over time. It is the soft pink flowers that appear from spring through to autumn that are the attraction. The flowers appear as terminal spikes on tall stems. If you can plant Salvia ‘Pink Velour’ against a darker foliage background they will seem to glow. 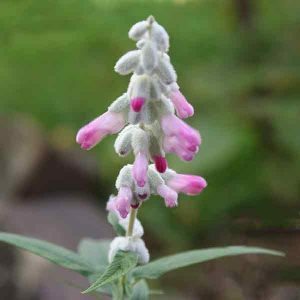 Salvia leucantha ‘Pink Velour’ – Summary Information. Height – Generally reaches around .8 metres in height. Spread – Will spread to form a bushy clump to .5 – .7 metres across over time. Flowers – A mid pink with white from spring through to winter. Use ‘Pink Velour’ in the garden border as a feature plant, or use it as a low growing hedge or border plant. For those with smaller gardens, grow it in a container in a sunny position. Excellent in both a cottage garden and a Mediterranean style garden. It is a very easy plant to prune, simply deadhead after flowering and it will reliably send up new shoots and flowers. It will generally send up new shoots from ground level, so you can prune back harder if you wish. At the end of the season cut back to the ground. Mid pink flowers with that touch of white and a velvety velour texture make this a standout salvia. Note – Not all nurseries will stock all plants year round, if you can’t find it let us know.